The Martin Van Buren Presidential Dollar was released for circulation on November 13, 2008. This was the eighth coin in the Presidential Dollars series and the final release for the year 2008. Martin Van Buren was a President of two important firsts. He was the first president from New York, and the first president born as an American Citizen. Before being elected President, he served as governor of New York, Senator, Secretary of State, and Vice President. Van Buren served as the 8th President of the United States for one term from 1837 to 1841. An official launch ceremony for the Martin Van Buren Dollar was held on December 5, 2008 at the Martin Van Buren National Historic Site at Kinderhook, New York. The event was attended by United States Mint Deputy Director Andrew Brunhart, Mayor Bill Van Alstyne, and coin designer Joel Iskowitz. Attendees witnessed a ceremonial coin pour and were allowed to exchange currency for roll of the newly issued coin. The obverse features a portrait of President Van Buren, designed by Joel Iskowitz and sculpted by Phebe Hemphill. 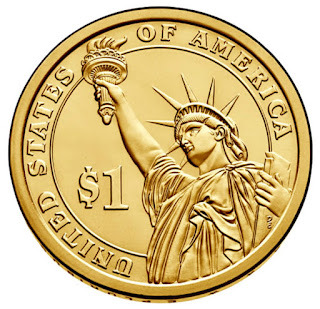 The reverse of the coin features a rendition of the Statue of Liberty by Don Everhart. This design has been used on the reverse of all Presidential Dollars. 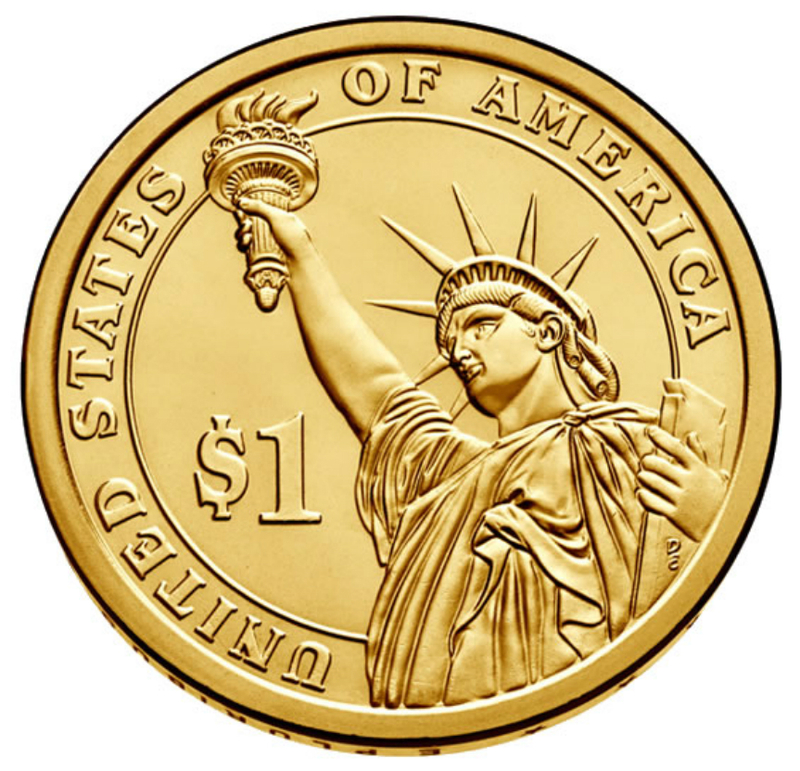 This was the final coin of the series which would include the motto “In God We Trust” on the edge of the coin. In the following year, it was moved to the obverse. Mintage levels for the series resumed their decline with the Martin Van Buren Presidential Dollar. Just over 100 million coins were produced for circulation at the Philadelphia and Denver Mint facilities. In addition to the circulation strikes, the United States Mint also produced special versions of the coins for collectors. This included proof versions struck at the San Francisco Mint and satin finish versions struck at the Philadelphia and Denver Mints. These coins were included in annual coin sets and other numismatic products. Martin Van Buren (Dutch: Maarten van Buren; December 5, 1782 – July 24, 1862) was an American politician who served as the eighth President of the United States (1837–1841). Martin Van Buren, the first president from New York and not of British descent, was also the first president to be born an American citizen. Raised in a Dutch neighborhood in Kinderhook, New York, his interest in politics took root at his father’s tavern where prominent politicians, including Alexander Hamilton and Aaron Burr, would stop by on their travels. A member of the Democratic Party, he served in a number of senior roles, including eighth Vice President (1833–1837) and tenth Secretary of State (1829–1831), both under Andrew Jackson. Van Buren's inability as president to deal with the economic chaos of the Panic of 1837 and with the surging Whig Party led to his defeat in the 1840 election. Of Dutch ancestry, Van Buren learned early to interact with people from multiple ethnic, income, and societal groups, which he used to his advantage as a political organizer. A meticulous dresser, he could mingle in upper class society as well as in saloon environments like the tavern his father ran. A delegate to a political convention at age 18, he quickly moved from local to state politics, gaining fame both as a political organizer and an accomplished lawyer. Elected to the Senate by the state legislature in 1821, Van Buren supported William H. Crawford for president in 1824, but by 1828 had come to support General Andrew Jackson. Van Buren was a major supporter and organizer for Jackson in the 1828 election. Jackson was elected, and made Van Buren Secretary of State. During Jackson's eight years as president, Van Buren was a key advisor, and built the organizational structure for the coalescing Democratic Party, particularly in New York. In 1831, following his resignation as Secretary of State, Jackson gave Van Buren a recess appointment as American minister to Britain, but Van Buren's nomination was rejected by the Senate, cutting short his service in London. He was successful in the jockeying to become Jackson's picked successor, and was elected vice president in 1832. Van Buren defeated several Whig opponents in 1836, and was elected president. He was the third sitting Vice President to be elected directly to the presidency, following John Adams in 1796 and Thomas Jefferson in 1800, and the last for 152 years, until George H. W. Bush was elected in 1988. As president, Van Buren initiated an independent federal treasury system to take the place of state banks’ handling of federal monies and peacefully settled disputes with Great Britain that were threatening to take the country to war. As president, Van Buren was blamed for the depression of 1837; hostile newspapers called him "Martin Van Ruin". He attempted to cure the economic problems by keeping control of federal funds in an independent treasury — rather than in state banks—but Congress would not approve of this until 1840. In foreign affairs, he denied the application of Texas for admission to the Union, unwilling to upset the balance of free and slave states in the Missouri Compromise, and hoping to avoid war with Mexico over Texas annexation by purchasing the territory from Mexico's government. Additionally, relations with Britain and its colonies in Canada proved to be strained from the bloodless Aroostook War and the Caroline Affair. In 1840, Van Buren was voted out of office, losing to Whig candidate William Henry Harrison. Van Buren was the leading candidate for the Democratic nomination in 1844, but lost to James K. Polk, who went on to win the election. In the 1848 election Van Buren ran unsuccessfully as the candidate of the Free Soil Party. He also supported fellow Democrats Franklin Pierce (1852), James Buchanan (1856), and Stephen A. Douglas (1860) for the presidency, but his increasingly abolitionist views and support for the Union led him to support Abraham Lincoln's policies after the start of the American Civil War. Van Buren's health began to fail in 1861, and he died in July 1862 at the age of seventy-nine. Although he served in many high offices, his most lasting achievement was as a political organizer who built the modern Democratic Party and guided it to dominance in the new Second Party System. 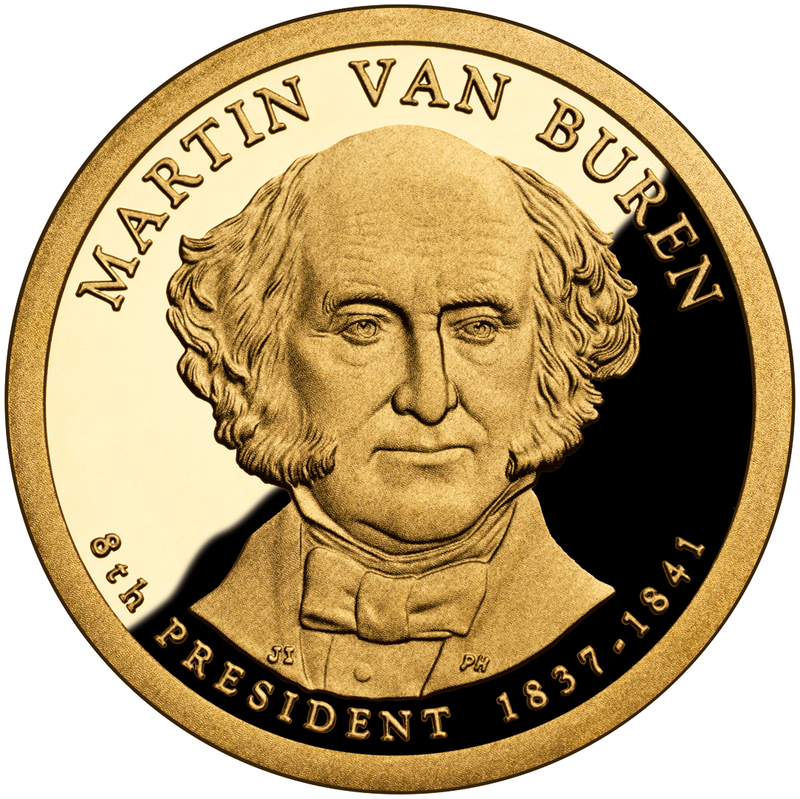 No coinage legislation was enacted under President Van Buren. President Martin Van Buren did not appoint a Director of the United States Mint.